Check out Tobi's Rebecca Off Shoulder Top Memories from your childhood, just better in the Rebecca Off Shoulder Top. 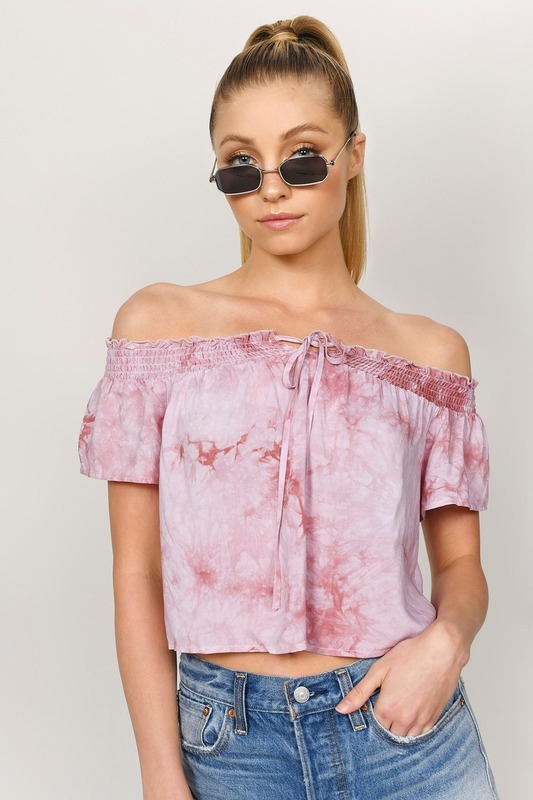 Make this tie dye top this season's go-to featuring a hot off shoulder silhouette with a stretchable elastic band and front tie. This casual top has a whimsical silhouette and charming cap sleeves that's perfect for picnics and warm weather outings. Memories from your childhood, just better in the Rebecca Off Shoulder Top. Make this tie dye top this season's go-to featuring a hot off shoulder silhouette with a stretchable elastic band and front tie. This casual top has a whimsical silhouette and charming cap sleeves that's perfect for picnics and warm weather outings.